Notice something different? Perhaps a new blog? Almost 6 months ago, we started planning our blog redesign to set launch in January 2018. And after many light-bulb moments and ongoing meetings with the design team, it’s safe to say, we hit the deadline successfully! Looking back, our old blog begged for a makeover. With new faces in our marketing team, a growing audience, and an improved content strategy, it was a matter of time before we decided to give our blog a new look and feel. Throughout 2017, we started to incorporate more content topics and mediums into our editorial calendar. For example, we’ve been writing more thought leadership and how-to articles on trendy topics like ‘Social Customer Care’. Problem was, our old blog didn’t reflect these fresh and creative ideas. Instead, it made a lot of great content fall through the cracks. As a result, it quickly became obvious to us that a new interface was long overdue. We needed to redesign the blog in a way that makes it fun and easy for visitors to discover valuable content – and ultimately, experience it. And our new blog does just that! It’s a winning formula of efficient content discovery combined with an immersive experience. 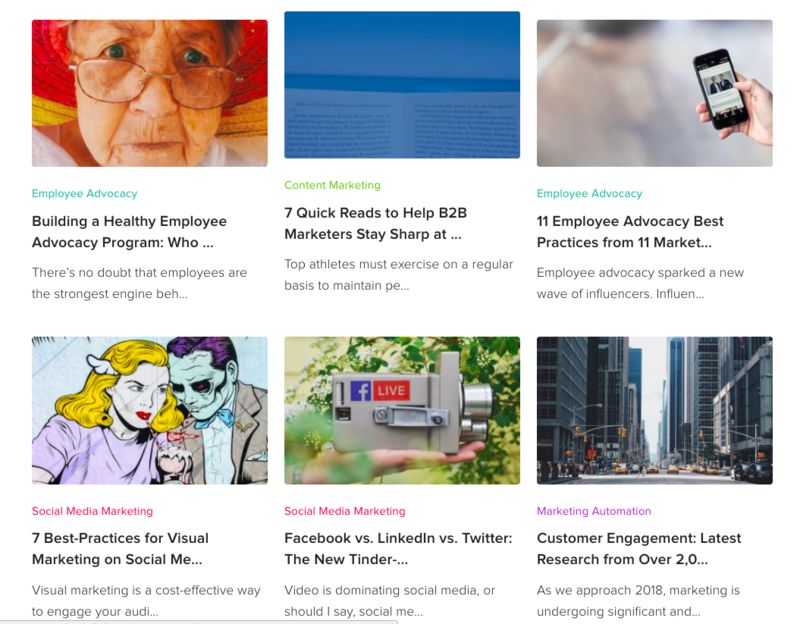 Starting at the top of the blog homepage, users get exposed to a full-screen slider, featuring our most recent articles as well as our most popular articles. Of course, these posts are updated daily in order to offer users a steady stream of compelling articles. Moving forward, we incorporated a set of built-in tools, which allow users to personalize their content feed, choosing marketing categories and tags that fit their preferences. With the shift towards engagement marketing, we believe this new navigation scheme enables audiences to find content that aligns with top-of-mind interests. To take it a step further, we also added a Related Articles section at the bottom of each post. 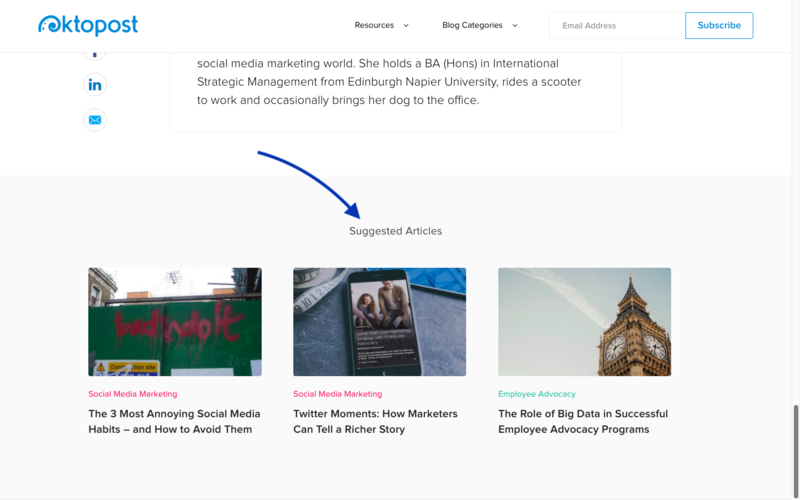 This section displays relevant articles based on conditional tags and categories – again, enticing users to stay highly informed of content they care about. When audiences visit a blog, one of the first things they are guaranteed to notice is the visual language. Needless to say, our blog lacked that visual stimulation – users were merely exposed to a single strip of chronologically-structured content. Once we recognized the positive impact that visuals could have on our audience engagement, we decided to give it a real push! The new blog introduces a modern and sleek appearance, showcasing pixel-perfect images, vivid colors, and bold text. From the moment users land on our blog’s front page until they navigate through different articles and categories, we hope to give them a memorable experience. Our product team are big believers in responsive web design as it is the only way to provide a seamless experience across every device – phone, tablet, and desktop. Using this approach, we were able to integrate a high-resolution, full-scale cover image, which stretches to fit the entire screen. These cover images are displayed at the top of our blog homepage and on every article. Moreover, the bright color scheme plays a considerable role in engaging users while enabling them to easily distinguish between different content topics. While too many colors can cause the blog to look cluttered and even childish, we made sure to use them subtly without overpowering the professional nature of our blog. As such, each category is assigned a specific color. 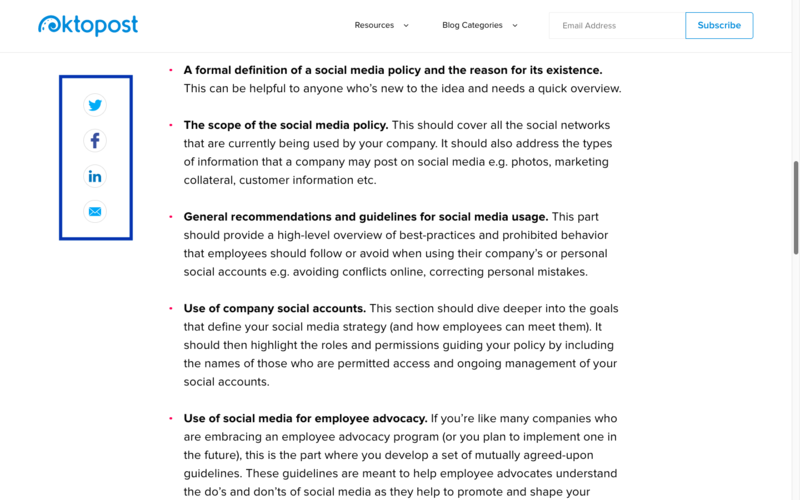 This is reflected through the microscopic elements of the article, such as the bullet points, quote, and call-to-actions. Once you get visitors to read an article, the next step is to encourage them to share it. Seems like a no-brainer, right? Having said that, our previous blog content wasn’t exactly optimized for sharing, which meant that we were missing out on a large pool of potential audiences. In light of this, we decided to implement two interesting ways of sharing our content; both of which, are extremely effortless on the user’s part. 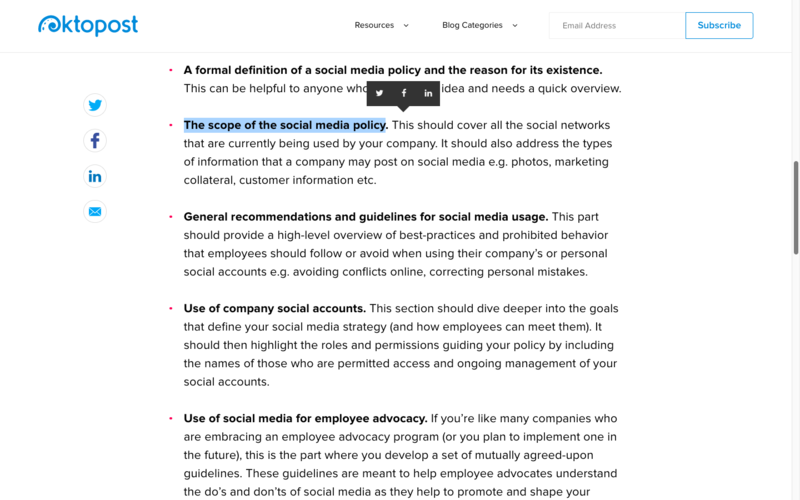 The first method introduces a sidebar for sharing a blog post via Twitter, Facebook, LinkedIn, and email. Unlike most sidebars, this one sticks while the user scrolls, serving as a quick reminder to share with their friends. The second method is a hovering share menu that appears when users highlight any string of text. This is another great way to encourage our readers to share a quote or sentence they liked. A stellar design finds the middle ground between being aesthetically pleasing and emphasizing the written content. In other words, a beautiful design shouldn’t interfere with the sole purpose of the blog – to read articles and eventually subscribe. A single scale never looks good. That’s why having a super-sized article headline is a sure way of creating juxtaposition and ultimately grabbing our audience’s attention. A quick scan of the headline is all that’s needed to understand what the article is about. Consistent with the bold headline, the sub headers also make an impact when contrasted with the rest of the text. Assigning different sub-heading sizes allows for better structure and coherence of the article. Sub-headers also help us break down and simplify the reading of a more complex or in-depth article. 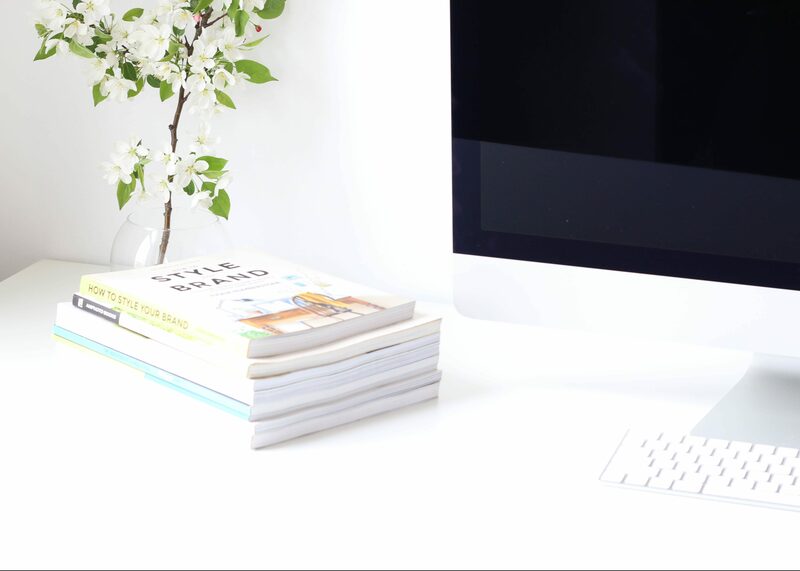 When looking at other successful blog UI’s for inspiration – in particular, Medium and Typeform – what stood out to us was their use of whitespace. Whitespace refers to the clean and empty space between graphics, margins, text, images, etc. Although our previous article format embraced whitespace, it still gave the feeling of being over-crowded and noisy. That’s why our new article format has double the amount of whitespace in the side margins. This creates a more elegant and sophisticated feel while giving our writing extra room to breath. Another exciting change is the addition of block quotes. We use these to pull a text passage out of the reader’s flow to give it more importance. OK – maybe it’s not a dramatic change, but after all, it’s the minor details that give your writing more depth. Let’s be honest, our old blog looked a little tired and outdated. Besides not being structured in a way that would let our content shine, it didn’t blend with some of our other, more modern pages across the website. More importantly, it didn’t speak our brand language, let alone the new language we’re starting to adopt. Consequently, it started to affect our ability to retain new audiences. As you’ve probably noticed, our blog underwent quite a visual transformation. Not only has it revamped the way we serve up content with systematic filtering, it’s also given us the opportunity to showcase the new direction our brand is heading in. For example, the new blog has more splashes of color across the image filters, category titles, and buttons – which reflect our updated color palette. A new design means a new beginning – and what a better way to start 2018 than with a fresh, new look. Taking this new design approach allows us to be more strategic about the way we structure, tag, and deliver our content. Above all, the redesign ensures that visitors never miss out on content they care about and can easily surface content that piques their interests. If you’re considering a redesign of your own blog, the best method is to just go for it! A blog that doesn’t reflect your brand, fails to increase subscribers, or doesn’t align with your content strategy, deserves a change.